Its fruits ripen on the tree and drop from it during winter. Then its seeds dry up. Each fruit has fifteen to sixteen seeds (that is, rudrakshas). The more the seeds, the smaller is their size and the less is their price. Instead of using a small rudraksha alone, many small rudrakshas are strung together with one large rudraksha. A Rudraksha has a natural opening from one side to the other; it need not be created. 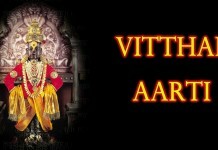 This opening throughout its diameter is known as vahini ( A channel ). Rudraksha is reddish in colour, with yellow stripes and is flat like a fish. On one side it has an open mouth. A rudraksha having more than 10 openings is called a Maharudra. Rudraksha takes the radiance from the atmosphere and converts it into oil. If we chant ‘Om Namaha Shivaya’ sitting under a rudraksha tree, fragrant oil will emanate from a rudraksha for 24 hours. 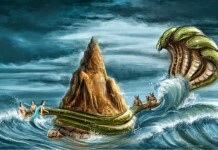 This oil will spill out if we blow into the hollow of the rudraksha. The oil of rudraksha has a pleasant odour. This oil is extracted from its tree too. Once the rudraksha is made effective, it emits air instead of oil. The rudraksha transforms light waves of Deities in the universe into sound waves of the human body and vice versa. As a result, man can absorb waves of Deities and human thoughts can get converted into the language of the Deities. 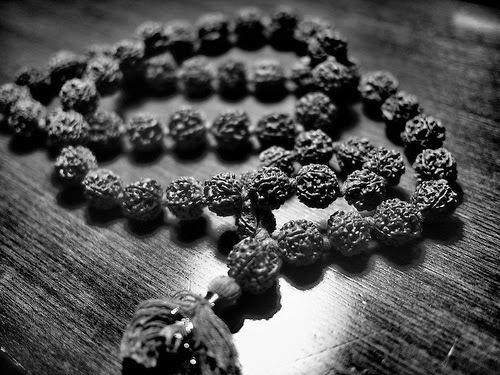 The rudraksha absorbs sama ( Sattva (note) ) waves. Similarly, sama waves are emitted by its crests. A real rudraksha can be recognised by the vibrations felt upon holding it. At that time, the body absorbs the sama waves emitted by the rudraksha. If a rudraksha is held between the thumb and the ring finger, vibrations will be felt anywhere in the body. Even if kept nearby, the effect of a rudraksha is felt up to half an hour. Thus, during that period we are able to perceive vibrations even if any other object is held with the fingers. However, if the hands are washed with water, the vibrations cannot be perceived. Any Deity’s Name can be chanted by holding a rudraksha. Rudraksha is a large evergreen broad leaved tree. Its scientific name being Elaeocarpus Ganitrus Roxb. The family is tiliaceae. Altitude wise, its habitat starts from sea coast and goes up to 2000 metres. Geographically, it is found growing naturally and abundantly in tropical and sub tropical areas. The trees are perennial in habitat. The trees are 80ft to 120ft tall. It takes 8 to 10 years to start bearing fruits. According to Shiva Purana, Rudraksha trees grow in Gouda Pradesh which presently encompasses the Gangetic Plain, the southern border area of Asia to the foothills of Great Himalayas and middle area of Nepal. Thus starting from Manila,passing through Myanmar, its habitat extends to Bengal, Assam and adjoining North Eastern States, Bangladesh, Bhutan, Nepal. Elaeocarpus is a large genus of evergreen trees. There are about 36 subspecies of the genus, including Rudraksha. The trees are 80 to 120 feet tall. All trees bear white flowers with fringe petals developing into drupaceous fruit resembling olives. The flowers are ovoid, conical, elongate, nearly one to two centimeter. They appear in April – May. The fruit is globose and drupaceous having a fleshy exterior. The beads inside are hard and tubercled. The main trunk of Rudraksha tree is cylindrical, the bark rough in texture, colored grayish white with small vertical lenticels and narrow horizontal furrows. 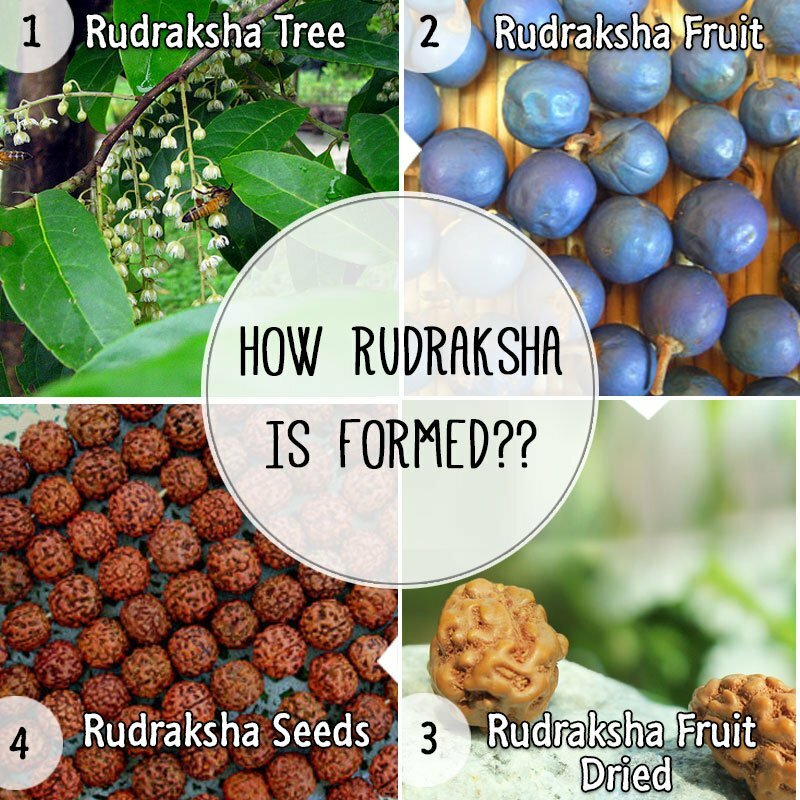 Rudraksha trees takes 8 to 10 years to start bearing fruits. 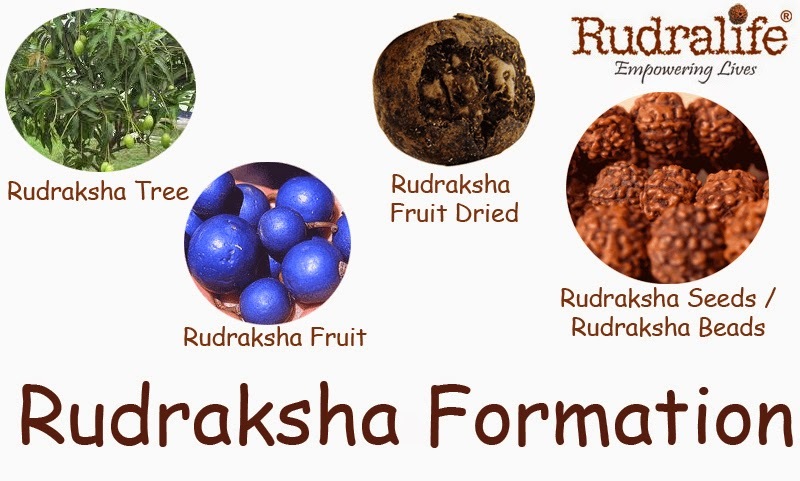 Rudraksha is a seed fruit, which is covered with an outer skin. The fruit starts appearing in June and ripens by August to October. The skin of the fruit is green in colour like banana skin. Its pulp, tasting sour, is eaten by the birds, when raw. But when matured, the colour of the skin turns to blue and then takes on a blackish hue. With such deep blue, sometimes violet coloured fruits all over, the tree looks magnificent. It is often called Blue Marble Tree. The seed can have 1 to 21 Mukhis. The mukhis or the facet is easy to count and is a natural division of the seed. A mukh is a complete line from top to bottom of Rudraksha. Many studies have been carried out for the scientific explanation of different effects of various faces. The Indian epics are full of varying affects of wearing Rudraksha of different faces. More than 75% of Rudraksha available naturally are 5 Mukhis (Panch Mukhis) and they are also very powerful with several attributes for the mankind. Prices of different mukhis Rudraksha are only due to availability and should not be linked to the effects. Next articleWhy should Tulsi not be chewed with teeth? Very Nice article for formation of rudraksha.